A presentation on cervical cancer prevention at her church persuaded Nostina Ngomane to volunteer and counsel women on participating in cervical cancer screening. Maputo, Mozambique—An active volunteer in her church, Nostina Ngomane was among the parishioners of the Presbyterian Church of Mozambique who turned out one evening to hear a Ministry of Health official and fellow church member discuss the risks of cervical and breast cancer. Deeply concerned about women’s health, Dr. Lidia Chongo, the National Deputy Director for RH/MNCH (Reproductive Health / Maternal, Newborn and Child Health), explained the importance of early screening and urged congregants to seek services. Chongo arranged for screening and treatment services to be held at two large health facilities in Maputo and asked Ngomane to encourage churchgoers to participate. 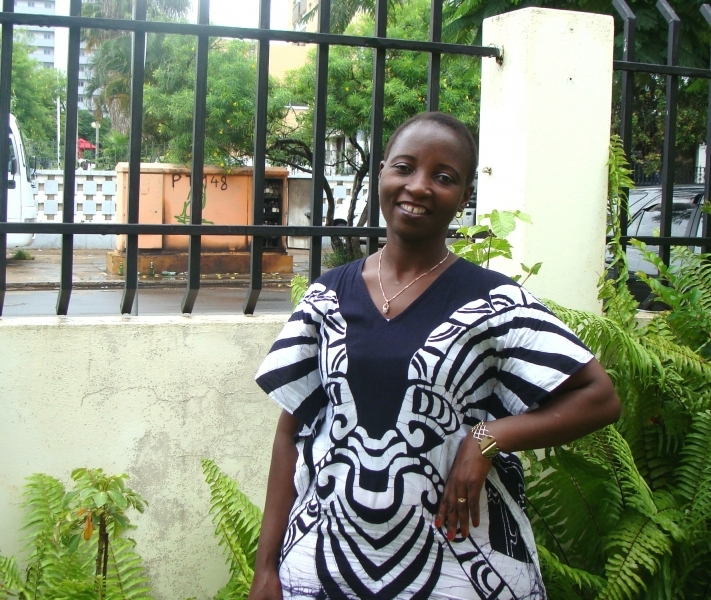 Ngomane, who works as a court administrator and attends law school, embraced her new role as a lay peer educator. The 43-year-old actively reaches out to other women, talking to them about cervical and breast cancer, HIV and family planning and encouraging them to get screened. She works directly with the screening sites—Polana Caniço Clinic and the Central Hospital—supported by the U.S. Agency for International Development’s global Maternal and Child Health Integrated Program (MCHIP), which is led by Jhpiego. A widowed mother of two, Ngomane was one of the first women in her parish to get screened, saying, “I am a curious person, and I am curious about health and how the body works. I was not afraid to get screened; I was happy, I even felt pride.” When she went for the service at one of the MCHIP-supported sites in June 2012, Ngomane was screened through the visual inspection with acetic acid (VIA) or vinegar approach, a safe, effective, low-cost method pioneered by Jhpiego and adopted by the Ministry of Health to be used throughout Mozambique. She tested positive for precancerous lesions of the cervix and then received immediate cryotherapy treatment (freezing of precancerous cervical cells)—in accordance with the single visit approach that Jhpiego advocates. Ngomane dutifully attended all of her follow-up appointments. A year out, both a visual inspection and a confirmatory Pap smear revealed that she is cancer-free. Cervical cancer is the second leading cause of cancer deaths of women in the developing world. If caught early, this disease is easily treatable. In an effort to increase access to screening and ensure sustainability of the program, the Ministry of Health integrated cervical cancer screening with family planning and HIV services. HIV-positive women are at greater risk for this cancer, and given the prevalence of HIV in Mozambique, offering integrated services is a “no missed opportunities” approach to reach women. The National Cervical Cancer Prevention and Treatment Program in Mozambique was officially launched by the Ministry of Health in 2009. The program approach includes screening of cervical lesions using 3–5 percent acetic acid and treatment with cryotherapy through the single visit approach at basic health facilities. Since the launch, the Ministry of Health, supported by MCHIP and funded through the President’s Emergency Plan for AIDS Relief (PEPFAR),has built the capacity of 691 health professionals to provide VIA and cryotherapy services. Since 2009, more than 94,000 women have been screened for cervical cancer and 7,986 (8.5 percent) tested positive for precancerous lesions using VIA. Of the 7,986 VIA-positive women, 777 (9.7 percent) were found to have large lesions (ineligible for cryotherapy), so they were referred for further treatment. Out of the remaining 7,209 women who screened positive and were eligible for cryotherapy, 3,997 (55.4 percent) received cryotherapy on the same day as their screening. There is a strong commitment from government and civic organizations to raise awareness and advocate for cervical cancer prevention, early detection and treatment of precancerous lesions. Such efforts are being made through national, provincial and district meetings with women’s groups, community and religious leaders, and other civic organizations. Matias Anjos, Maria Vaz and Veronica Reis also contributed to this article.